Although Robert Frost (1874–1963) wrote poetry throughout his youth and early adult years, his first collection of poems was not published until he was nearly 40 years old. And, ironically, it was not in America that this quintessentially American poet was first published, but in England. In 1912, he settled his family in Buckinghamshire, determining to devote his full life to poetry. In 1913, Frost published A Boy's Will, his first collection of poems. A series of sharply observed impressions of New England rural life touching upon universal themes, it included such poems as "Into My Own," "Asking for Roses," "Spoils of the Dead," and "Reluctance." 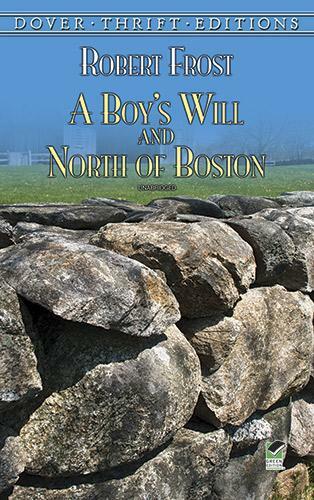 A second volume, North of Boston, followed in 1914 and contained several of Frost's finest and best-known works: "Mending Wall," "After Apple-Picking," "The Death of the Hired Man," and others. Both volumes are reprinted here complete and unabridged ― a treasury of fine early verse by one of the 20th century's most admired poets.